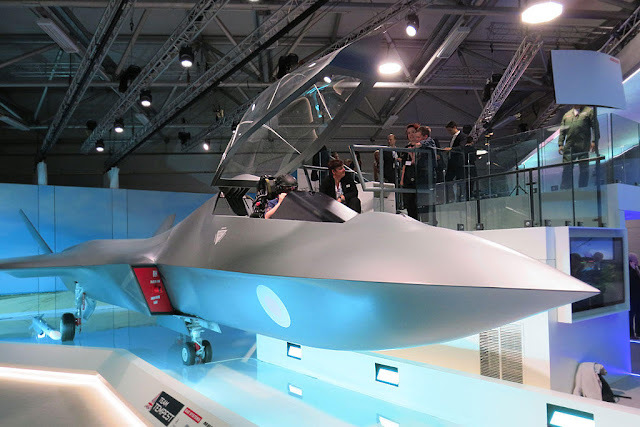 Image Attribute: The full-scale combat aircraft concept model of the Tempest, at the Farnborough Airshow 2018, south-west of London. On July 16, 2018, at Farnborough Airshow, the United Kingdom's Defence Secretary Gavin Williamson unveiled a state-of-the-art combat aircraft concept model — "Tempest". During the unveiling, he also announced the publication of U.K.'s new "Combat Air Strategy (CAS)" report — to strengthen the U.K.’s role as a global leader in the military aviation sector and to protect key skills across the U.K. industrial base. Primarily, this strategy intends to ensure the "leading position" for the country in cutting edge of combat air technology. According to the Defence Secretary, the jet, is a part of an outcome of the Future Combat Air System (FCAS) technology initiative which was announced as part of the U.K's Ministry of Defence's 2015 Strategic Defence and Security Review. FCAS consists of three core strands of activity on developing an effective "Combat Air" technologies: international projects, including current and future works with France; national projects; and an open mission system architecture project. The CAS report clearly anticipates "the future air environment will become increasingly complex, with rapid technological advancements especially in sensing, data management, and autonomy. The information advantage will be critical, as will the ability to exploit and defeat emerging technologies". 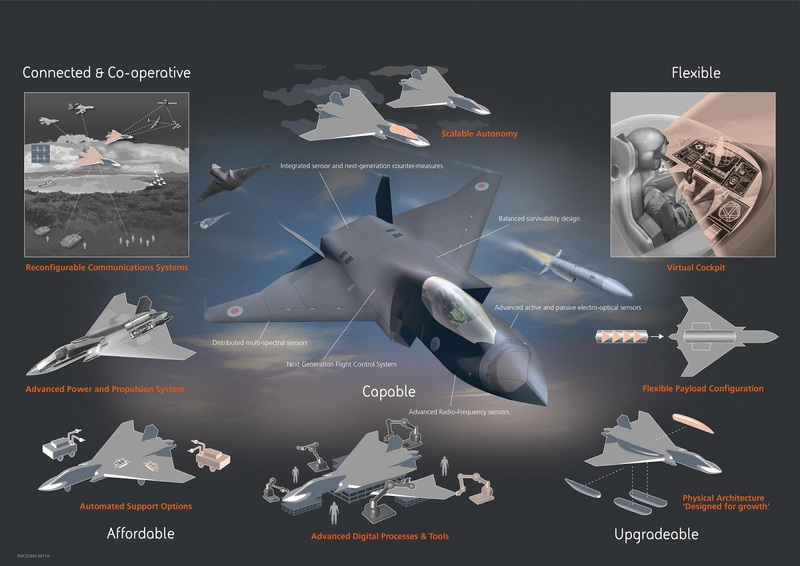 This new Royal Air Force (RAF) fighter jet will attract as much as £2 billion (US$ 2.65 billion) in investment (10-year allocation has been announced within the 2015 Strategic Defence and Security Review) and will be developed in a joint venture (as a pilot project) by "Team Tempest" which includes UK's biggest defense contractor BAE System (key technology area: advanced combat air systems and integration), British jet engine maker Rolls Royce (key technology area: advanced power and propulsion systems), European missile maker MBDA (key technology area: advanced weapon systems), and Italian defense firm Leonardo (key technology area: advanced sensors, electronics and avionics). Under this JV, Government-Industry partnership is being envisioned as a catalyst and considered as a testbed for the changes like new, collaborative ways of working which will align incentives, minimize transactional costs and ensure all sides are held to account for achieving an optimal performance. Upgradable: Physical Architecture — "Designed for Growth"
"Tempest" will be either be flown traditionally by pilots or as a drone, with an ability to survive the most challenging combat environments. Eventually, the aircraft will be deployed in conjunction with the RAF F-35s and replace the Typhoon fighter jets in near future. The year 2035 has been set as a target to achieve a full operational capability. 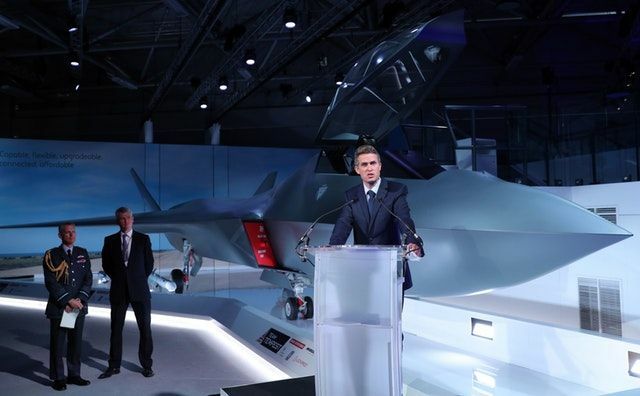 Image Attribute: Gavin Williamson, the U.K's Defence Secretary, speaking at the unveiling of the new Tempest fighter at the Farnborough Airshow 2018. Gavin Williamson said, "We have been a world leader in the combat air sector for a century, with an enviable array of skills and technology, and this strategy makes clear that we are determined to make sure it stays that way." Further, he added that U.K is not against forming a "Tempest" partnership with other nations. However, Germany and France are already working on a new jet, with the program led by France’s Airbus, part of the Eurofighter consortium and Dassault Aviation SA, the maker of the Rafale - in which U.K, remain excluded. However, in 2012, France and the U.K. signed a Memorandum of Understanding (MoU) for an unmanned Future Combat Air System. With reference to that MoU, The Future Combat Air System Demonstration Programme Preparation Phase (FCAS DPPP) contract was awarded to BAE Systems and Dassault Aviation to mature and demonstrate critical technology and operational aspects of a future combat air system. In 2014, the terms of the contract were announced under which parts from the BAE Systems Taranis was to be combined with the Dassault nEUROn to develop a joint European UCAV prototype. As of January 2018, the uncertainty appears to be fogging up the outcome as both the governments have revealed they are still examining the work of the industry teams. As of now, there are multiple European fighter projects (both, manned and unmanned) in the pipeline and the overall approach seems to be highly fragmented. Each participating country is going ahead with its own individual agendas and formulating distinctive or overlapping alliances to dominate the lucrative regional and global defense markets, by hedging their existing knowledge and capabilities.